Alan Houser, President of the STC, introduced him as the “most publicly visible technical communicator on the planet”. David started with a recap of his earlier address. He explained (again) how up to 2009, the acceleration in technological developments had led to a challenge and a paradox. The challenge concerns hardware where machines have become smaller and smaller, while our means to operate them, namely our fingers, have remained essentially the same size. The paradox occurs in software where companies often justify the most recent upgrade by piling on yet more new features – without necessarily having a good place to put them. David Pogue delivering the keynote speech at the STC Summit 2013. Photo by Nitza Hauser. Out of this challenge and this paradox comes the unexpected situation where a company such as Apple can achieve a competitive advantage by successfully eliminating features in a device such as the iPod. This cult of simplicity sells, and the product or service with fewer buttons win, whether it’s an iPad or the Google start search screen. The reason why this works is psychological, says David: Achievements give us joy and make us feel that, yes, I can do this, and for this, I’m a good person. Conversely, not understanding how stuff or works or why stuff is so weird terrifies us. Which brought David to Windows 8 and his task to write book for his “Missing Manual” series about the operating system. David made it clear that he appreciates much about Windows 8 – however, there are certain features that drive him crazy because they task him with documenting something that makes no sense – a feeling many tech comm’ers know well. Specifically, Windows 8 presents two versions of many applications, two browsers, two e-mail clients, etc. – one in the GUI with tiles and one in the regular desktop. In the tiles GUI, there are no folders or files – and the control panel with system settings is only available via search. David thought the main issue was the decision to combine the two GUIs. The common desktop is a more cumbersome but runs all applications and is known to most Windows users today. “TileWorld” has its advantages in a mobile tablet world, but is unsuitable for many uses such as drawing, spreadsheets, word processing, etc. – all these don’t work well with gestures on a large touchscreen on the desk in front of you. David ended his keynote to rousing applause as he regaled us to his very own version of the show tune “I Feel Pretty”, “Im On Twitter”. Tech comm’ers and UX’ers can and should join forces because we have essentially the same goals. Barcamps can be a fantastic alternative to conventional conferences. While the 270 attendees were a mixed bunch, to be sure, I met only about a handful of technical communicators like myself. So what was it like to be a tech comm’er among hundreds of UX professionals, graphic designers, information architects, web designers, etc.? That’s a pity because at heart UX and tech comm share a gommon goals: We both make products mean something to customers. We just do it in different ways: UX’ers design the actual experience. Tech comm’ers help the user along with additional instructional, background, and technical information, when necessary. If tech comm’s user assistance is embedded in UX’s user interface we actually blur the boundary: User assistance can start with UX field labels and progressively disclose more documentation via tool tips to a full-blown help system. 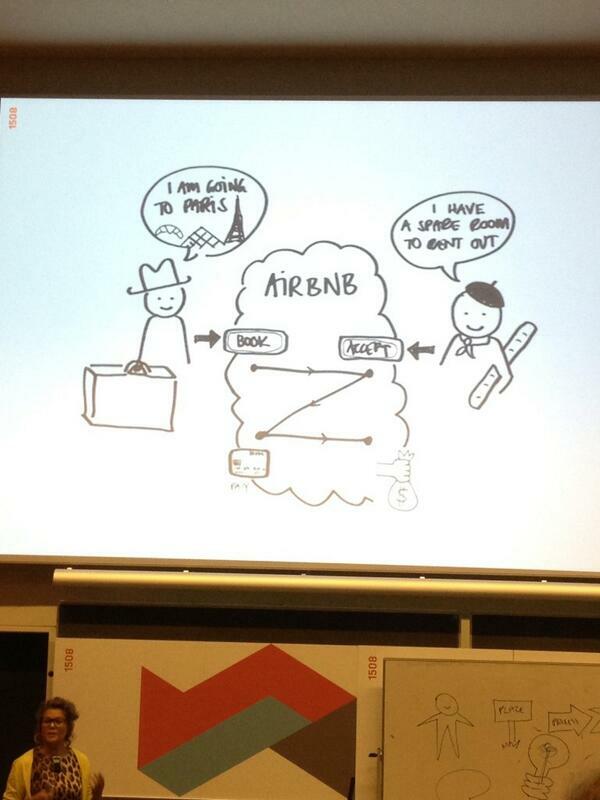 What makes a barcamp special? A barcamp tries to avoid many of the hierarchical pitfalls of conventional conferences. It emphasizes participation and networking over listening and consumption. The general motto is “You are the barcamp” – and the program is built at the beginning of event when potential speakers pitch their ideas for sessions. Depending on the number of votes from attendees, speakers get a spot on the program. 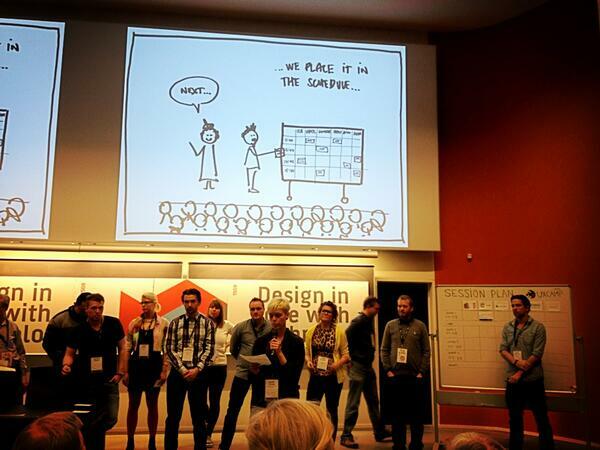 At UXcampCPH, everybody got to speak: Of approximately 270 participants, there were only 16 pitchers for the 24 session slots. The event was a bit special in that they invited 3 keynote speakers – which often isn’t done at barcamps to stress the egalitarian, participatory vibe. But in Copenhagen, the keynotes worked well by bringing everyone onto the same page (see my previous post of session summaries). If you know more reasons why tech comm and UX should join forces – or what distinguishes barcamps from conferences – feel free to leave a comment! O’Reilly sells ebooks from the publishing group Elsevier at half price until 23 April. I blog about it because I think this is a good deal. Also, I like O’Reilly ebooks because they are DRM-free. I am not affiliated with O’Reilly or Elsevier. I get no payment in money or in kind for writing this. Here are some titles of interest for tech comm and UX people. So if you’ve heard about one of these titles or keep it on a list of books to check out, here’s a good opportunity. The info below is straight from the O’Reilly web site. Prices are before the discount. Use discount code WKESEVE to get 50% off until 23 April. 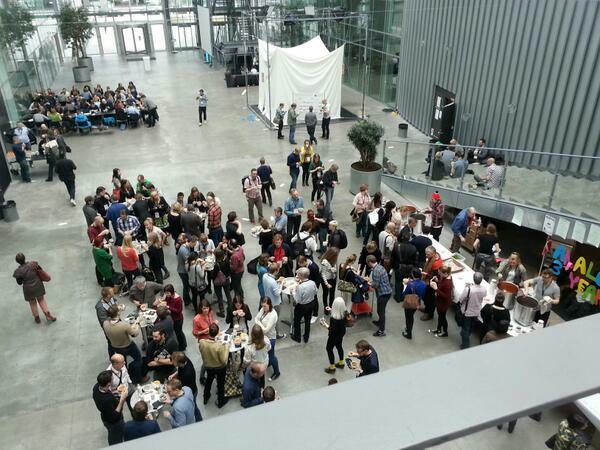 I attended UXcampCPH, a barcamp-type conference on user experience (UX) design in Copenhagen, last weekend. It was great! There were about 270 people from different countries and different professions, but all of them passionate about UX and willing to share what they knew in sessions and discussions. Huge thanks to the local organizers who were incredibly dedicated and competent all through the event and pulled it off without a hitch! And thanks to the sponsors who made this all possible. 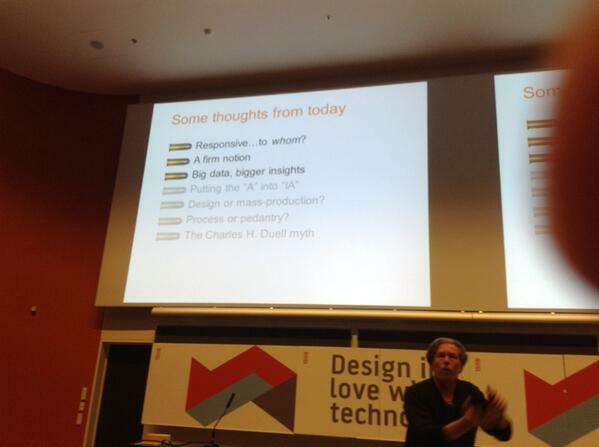 Andrea Resmini‘s keynote on Friday was a dense conceptual talk about navigation. Whether on a web site, in an app or in a city, navigation helps use to make sense of our surroundings. We use paths, of edges/walls and of nodes/intersections to choose from available options. In our navigation, our perceptions may differ from the physical reality as a city map never matches our personal idea of a city. But maps still are good, sharable representations of quests in which we act our personal narratives. On the web and in apps this means that we need to learn to “navigate the database”, for example, by perceiving Facebook as our regular bar: It’s probably not a perfect place, but it’s where all our friends hang out. So as we use navigation, we create our own choreography across several channels which makes our experience cohesive and meaningful. 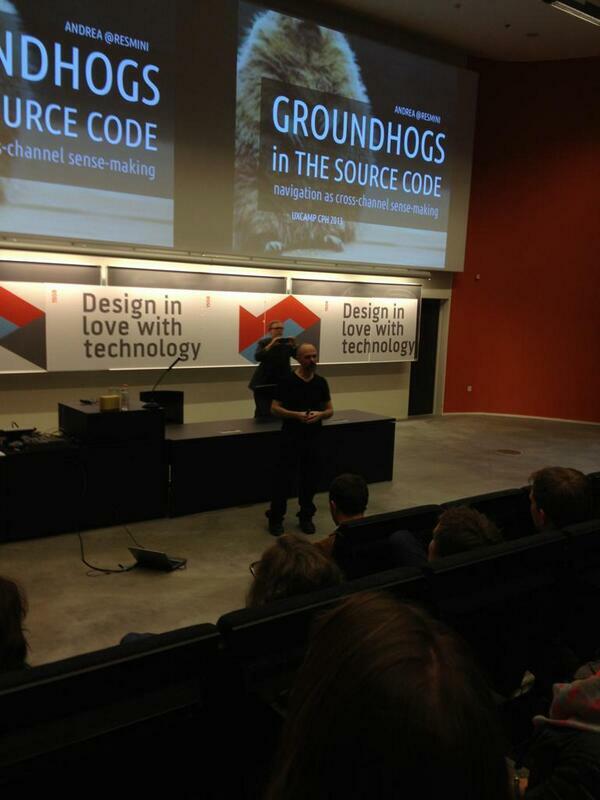 – I thought Andrea’s talk was a bit academic, but certainly thought-provoking. I was glad that a friend of mine had previously tipped me off to one of his earlier talks about “Pervasive IA” which I found a bit more pragmatic and a good introduction to Andrea’s work. 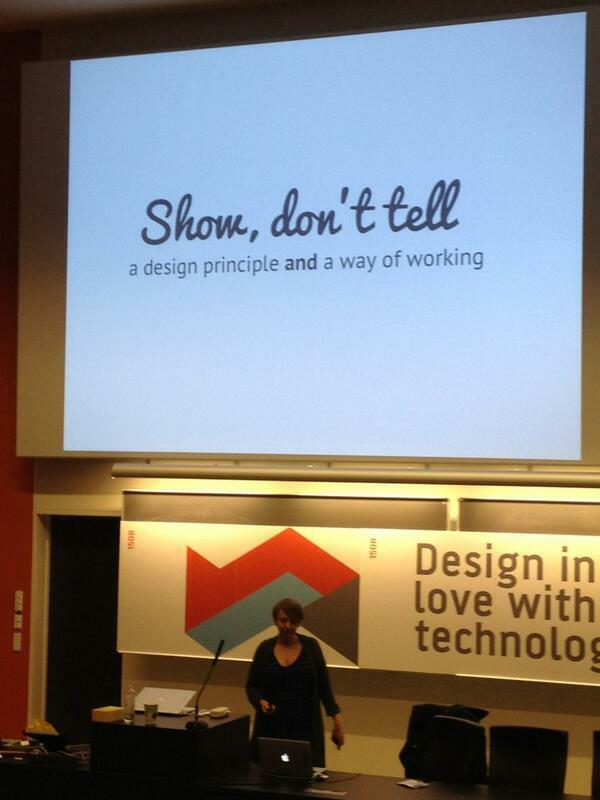 Leisa Reichelt‘s opening keynote was a well-argued, convincing plea for prototyping. Iterative prototyping beats waterfall projects – if you can afford it. Waterfall-model projects, Leisa said, are often more orderly than the projects and the real world which hosts them: They “require your best ideas while you still know least about the problem.” But if you start out the project with an assigned front-end developer and real content, you can start with a good idea and iterate your solution until it works in terms of quality and volume and until it satisfies the customer (or time/money run out). Prototyping, according to Leisa, beats abstraction, will expose stupid ideas quickly and helps to make good decisions based on real content and real solutions. It makes the strategy live in deliverables, not in meetings. Some companies find it more difficult or more expensive to throw away a prototype development than a solution design. But in either case you will most likely throw away something during a project. It’s an artisan model that doesn’t scale well: It’s great in one project, but it’s very difficult to assign the same developer or designer or technical communicator to two projects at the same time. In my own session, I talked about pattern recognition as an essential mental strategy for acquiring and disseminating knowledge, even though most of us are not aware of it. When applied consciously, UX designers can employ pattern recognition processes to develop effective user experiences more efficiently and help users orient themselves. – I sincerely thank the 100 or so people who attended my session for their kind, attentive reception. I am especially grateful for the engaged discussion we’ve had how pattern recognition can be applied to UX design. You can find my slides over at slideshare. Louise Klinker in her presentation showed the many ways how just about everyone can use sketching. First, she walked us through the basics how most people can draw basic shapes like a line, a circle, a rectangle, a triangle, a wavy line and a 5-pointed star. Then she showed how you don’t really need any more shapes than these. Put them together, and you can sketch people (a 5-pointed star with a circle instead of the top arm), place (houses or meadows) and process (using arrows, clouds, symbols). 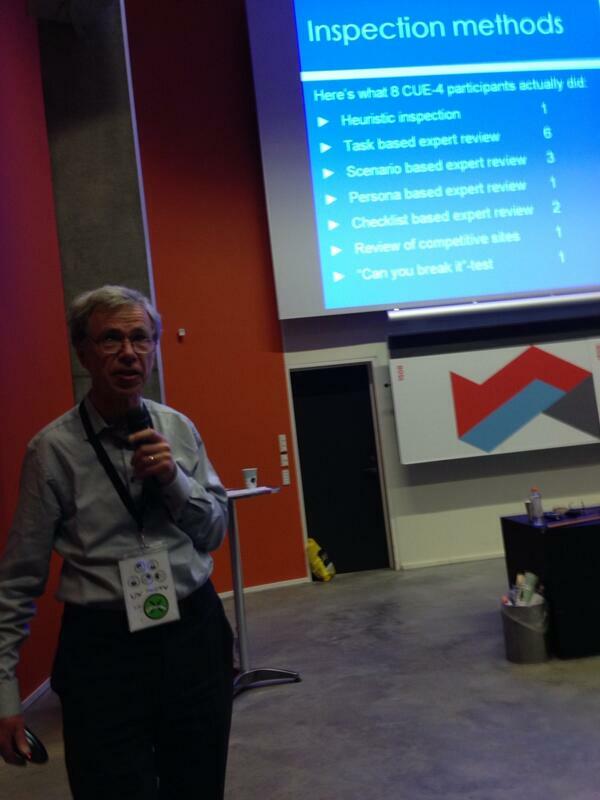 Rolf Mölich showed how expert reviews of web sites are as reliable as and not more expensive than usability tests with users – IF they are done right. Because data trumps opinion any time. To get expert reviews right, you need actual experts in both usability and the subject domain, these experts need solid methods, and the test needs open discussion to avoid dismissal of the experts’ results as mere opinions. – I liked Rolf’s interactive mode that had us signal our collective opinions about expert reviews using green, red and yellow (the latter for undecided). And I appreciated his candor when he admitted that he’d had second thoughts about the heuristic method he invented with Jakob Nielsen about 20 years ago. Anticipatory design can improve upon responsiveness. Responsive design often focuses on the device more than on the user. For anticipatory design, extract patterns of use and behavior and make the application situationally aware. The situation includes not just location, but also time of day: Around midnight, show me the bars close by, not the barbers. More isn’t better. A portal with 49 links and zero focus is not useful. 20 pages with a good story beat a thousand pages. 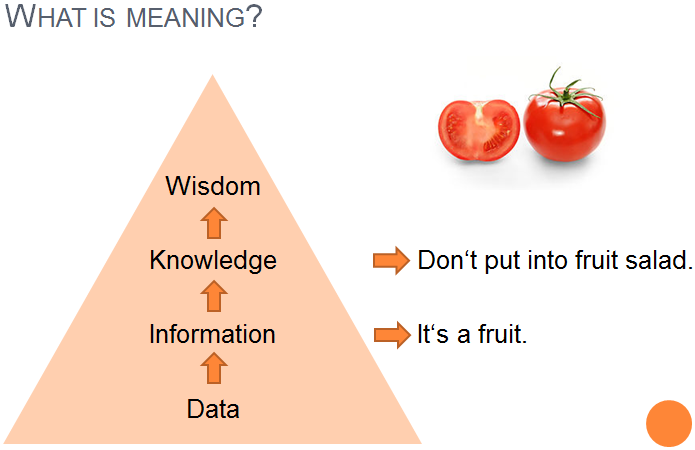 Big data, bigger insights. Spot patterns in user data and decide which are meaningful and relevant to your user experience to derive value. Create uniqueness. The “A” in IA (information architecture) is not only about structure and usefulness, but also about having a personality and beauty. Don’t worship form: Design patterns are mere templates, not design in itself. Don’t enslave yourself to the process. – Eric brought the barcamp to a great close with his lively presentation. I didn’t mind much that it was a collection of points rather than a coherent narrative, because I could recognize and connect to several of them as he summarized the last one and a half days. If you’ve attended one of the sessions, feel free to leave a comment or question! This week, I’ll be trying something new: I’ll attend UXcampCPH, my first “unconference”, in a neighboring discipline, namely user experience. That means unconferences emphasize participation and networking. Attendees bring presentations they want to present and pitch them at the beginning of the unconference. I’m expecting a good deal of “fly-by-the-seat-of-your-pants” attitude and possibly a glitch or two. Considering the occasional bust session I’ve caught at conventional conferences, I don’t think unconferences need to be worse on principle, though. User experience (UX) is one of those neighboring disciplines that I bump up against in tech comm ever so often. According to the ISO definition, it means “a person’s perceptions and responses that result from the use or anticipated use of a product, system or service”. Tech comm brings practitioners, theory and research to UX, as Ginny Redish shows in the first part of the article “Overlap, Influence, Intertwining: The Interplay of UX and Technical Communication“. Find out how UX people tick. Hanging out with them for a weekend will give me a good idea what’s important to them, how they approach their work and what they think of tech comm’ers. Include UX in my work. I’m hoping to get beyond my theoretical, distant understanding of UX towards a more practical grasp that can help me incorporate it better when conceiving and creating documentation. Spread tech comm goodness. In the second part of the article mentioned above, Ginny Barnum asks “Why should technical communicators claim a seat at the UX table” and endeavours to “stimulate technical communicators to join with UX specialists”. I guess some UX’ers might feel about tech comm the way I feel in reverse: They might know about it from more or less distance, but maybe not understand exactly what we do or how we add value. I’d be glad to point out where and how we can work together, each with our individual skills and talents. I’ll be one of the tech comm guys. If you attend UXcampCPH and are wondering what tech comm does or why documentation can be so weird, feel free to talk to me. I’ll be the pattern recognition guy. If you attend UXcampCPH, vote for me: I’ll pitch my presentation how we can apply cognitive processes to improve UX (and tech comm). Thank you!